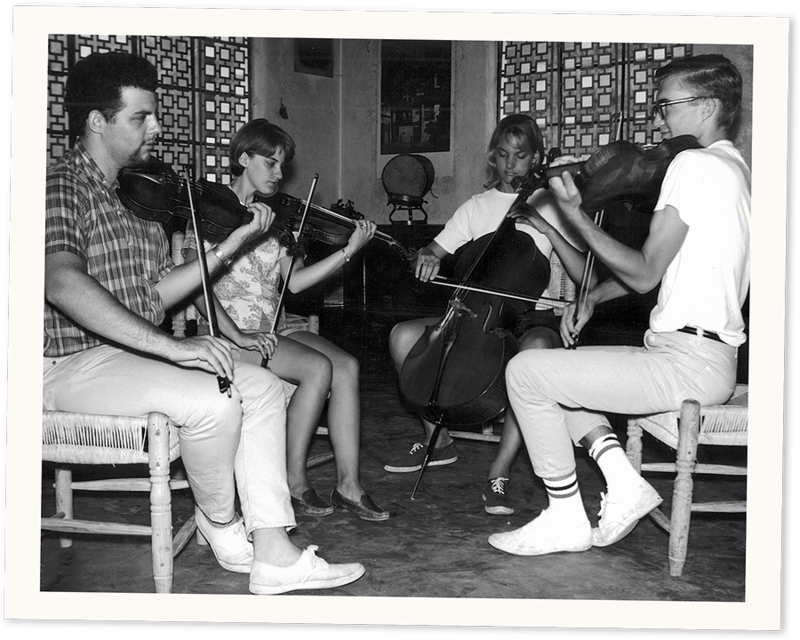 The dream of creating a summer chamber music program began in the early 1960’s and in 1963 that dream became reality when the first season of the school was underway. There were a number of local musicians who were early organizers. Chilton Anderson, a Taos area rancher and ski instructor in addition to being a cellist, had not been in on much of the early planning. However, when it got down to really going ahead with the school it seemed to the others that he might have the best business head of the group, so he was brought into the planning and was soon named director of the school. The program was not designed to teach aspiring musicians how to play; they are all playing at a professional level when they arrive. Instead, the school helps them perfect their skills and create music as part of a chamber group. Anderson ran the school for 44 years, assisted by his wife Judy Anderson and a volunteer board of directors. In 2005 the Andersons’ daughter Kathleen Anderson was named assistant director. In 2007 Kathleen Anderson became executive director and Chilton Anderson was named director emeritus. The first few summers the faculty consisted of musician friends who gathered to teach and perform. The faculty that first session in 1963 included violinist, Kenneth Schanewerk, head of the string department at Texas Christian University; cellist Harvey Wolfe from Arizona State University and then a member of the Cleveland Symphony; and pianist John Goldmark, who became Dean and later President of the Mannes College of Music. 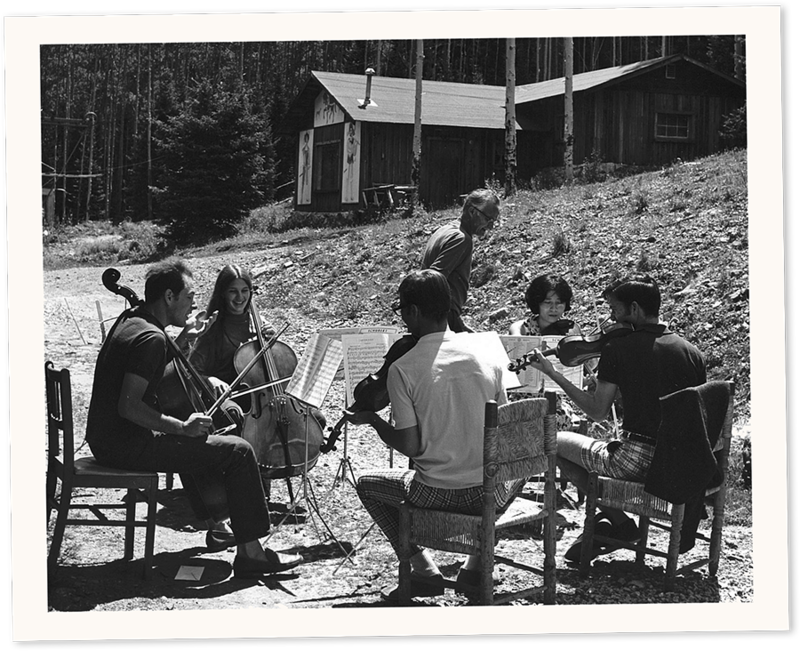 Although some fine instructors taught at Taos in those early years, it became evident that the school needed the continuity of a preformed quartet, and in 1975 the New Hungarian Quartet became the school’s first faculty quartet-in-residence. Then in 1979, the American String Quartet, at the time quartet-in-residence at the Aspen Music Festival and the Mannes College of Music, became the school’s faculty quartet, staying 20 years and developing a large following. 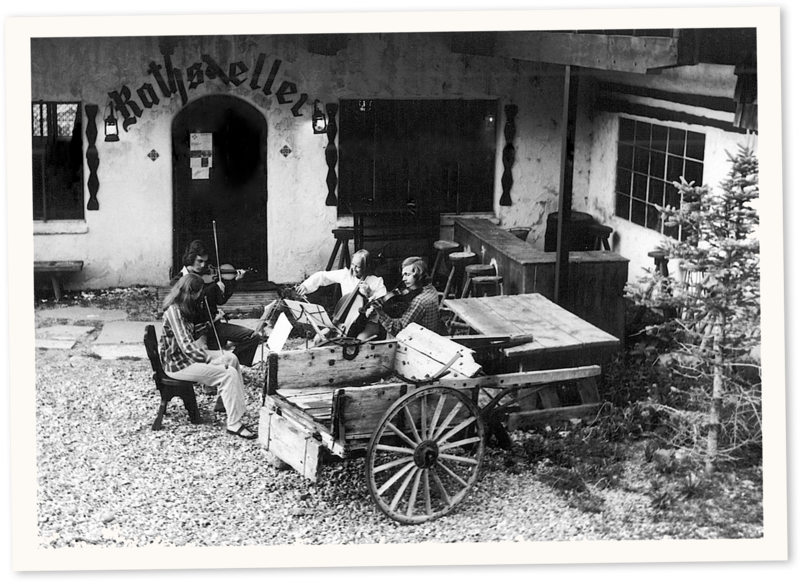 Several years before the Americans moved on, they were forced by scheduling conflicts to be in Taos for only six of the program’s eight weeks, necessitating a second quartet to fill in the last two weeks. Muir, Takacs, Angeles, Brentano and Vermeer were quartets filling that two-week period. The Chicago String Quartet took over the first six-week period following the departure of the American String Quartet, and were resident faculty at the school for five years before being replaced by the Borromeo String Quartet in 2005. In 2006, the format changed again. The Borromeo String Quartet became the resident quartet for the first four weeks, the Brentano String Quartet resident quartet the last two weeks and several other quartets filling in the middle two-week period. Those quartets were the Miami, St. Lawrence, Shanghai and Miro Quartets. Having three different faculty quartets over the eight-week period provides variety for the students as well as Taos audiences, Anderson says, and is expected to remain the format for the foreseeable future. Faculty pianists for the school began with John Goldmark, dean of the Mannes College of Music, and later piano instructors included Anne Koscielny, Professor of Piano at Hartt College of Music, who taught in Taos for over ten years. Robert McDonald, now on the piano faculty of the Julliard School and the Curtis Institute, joined the school in 1982 and continues as resident pianist and artistic director. Pianist Thomas Sauer, member of the Mannes Trio and alumni of Taos, has spent two weeks at Taos as piano faculty since 2011. He was also faculty in 2007 and 2009. Other guest pianists have been Randall Hodgkinson, faculty of the New England Conservatory of Music, and Paul Hersh, faculty at San Francisco Conservatory of Music. Over the years the school has also had a number of talented and inspiring guest artists. Michael Tree, a founding member of the Guarneri Quartet, has been returning as guest artist since 1992. Other guest artists have included Chris Costanza, cellist with the St. Lawrence Quartet, and Jupiter String Quartet. In the early years the school experimented with various numbers of students, but the enrollment has now stabilized at 19: eight violinists, four violists, five cellists, and two pianists. This combination can be used to create three string quartets, a piano trio and a piano quartet, or a combination of those for each two-week segment of the program. This size limit allows for close personal attention by the faculty and for a sense of rapport to develop between students and faculty which cannot be found in larger institutions. All students are advanced and professionally oriented. Young artists attracted by the school come from around the world and from the best universities and music institutions, including Curtis, Eastman, Indiana University, Juilliard, Mannes, Manhattan School of Music, New England Conservatory, Oberlin, Peabody, San Francisco Conservatory, Rice University, Colburn School of Music to name but a few, and the students have gone on to serve in major chamber groups and orchestras around the world. Taos Alumni are or have been members of chamber groups such as Muir, Jupiter, Brentano, St. Lawrence, Daedalus, Eighth Blackbird and A Far Cry to name just a few. All accepted students are awarded full tuition scholarships which cover coaching, rehearsal space, admission to all concerts, etc. There is a $700 fee for room and board for the eight week period. The Hotel St. Bernard at Taos Ski Valley was chosen as the home for the school because of the beauty of the location in the Sangre de Cristo Mountains, the hotel’s excellent facilities, and because it is the perfect distance from the town of Taos – close enough to permit access and far enough to prevent it from being a distraction. Students live, eat, practice, and perform at the Hotel St. Bernard, but organizers and instructors also wanted a more formal location for some concerts to give the young artists the experience of performing in a concert hall. Early concerts in the town of Taos took place in several locations, including the Harwood Auditorium and the First Presbyterian Church. The school settled into the Taos Community Auditorium after it was built in the early 1970s, and has performed most Taos concerts there ever since. That first season in the summer of 1963 was four weeks long, but it became obvious immediately that four weeks was not enough, so the program expanded to six weeks the following year. Then, at the request of the American String Quartet, the program was expanded to an eight-week session, which is the scenario today. 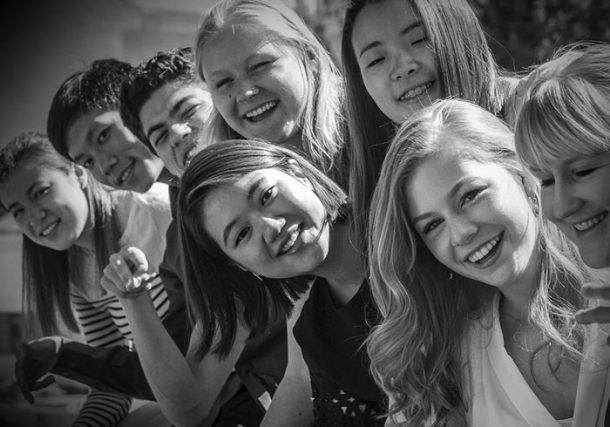 Unlike many chamber music programs, Taos School of Music includes piano, which means that all of the string students get to work in a piano trio or piano quartet at least once during the summer. In addition, Taos School of Music does not form groups that stay together for the entire summer. Each quartet or trio works together for a two-week period, gives a performance and then is broken up and new groupings formed. The reason? A great part of chamber music playing is learning to work with others, adapt to others musically, personally and emotionally. Although more difficult, the learning process is more pronounced when students have to deal with different people rather than becoming comfortable with the same three or four others. Also, the school does not pre-assign material. After students arrive, groups are formed and music selected. Much professional music making has to be done fairly quickly. The students at Taos have two weeks from being assigned their music to performance, and they have to learn how to pace themselves, rehearse, practice, and take time off, both from music and each other. Concerts presented by Taos School of Music faculty and Young Artists include both the traditional chamber music repertoire – Mozart, Brahms, Beethoven, and the rest – as well as more modern, sometimes even living composers. Performing groups are small, usually three, four, or five musicians. Audiences are treated to a kind of intimacy where they can not only hear the music being made but also experience the process that makes it.